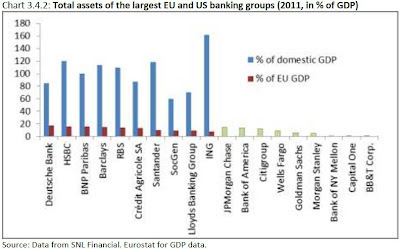 Yesterday saw the release of the hefty Liikanen report (a dense 153 pages) on the European banking sector. We’re yet to fully sift through the report but there a quite a few eye catching graphs and statistics which we thought worth flagging up. Mandatory separation of proprietary trading and other high-risk trading activities. Possible additional separation of activities conditional on the recovery and resolution plan. Possible amendments to the use of bail-in instruments as a resolution tool. A review of capital requirements on trading assets and real estate related loans. 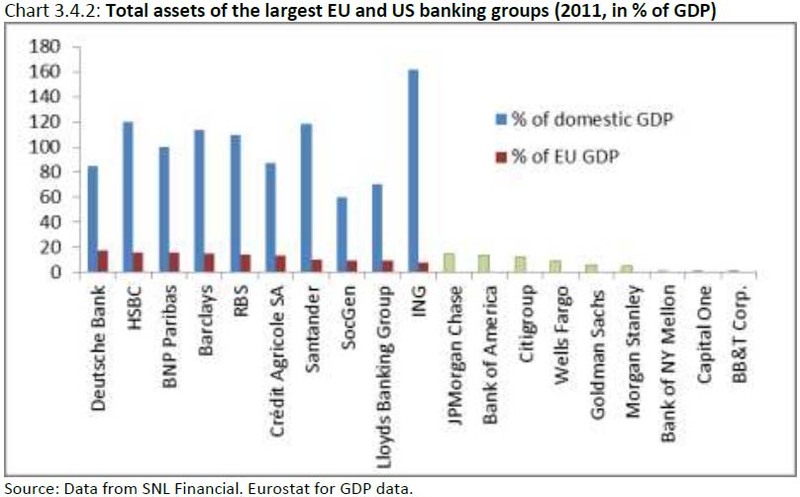 The table and graphs above demonstrate the simply massive size of some of Europe's banks, even in comparison to those in the US and Japan. This drives home the fact that, for a banking union to ever really work or be effective there must be combined deposit and resolution fund backing it up, something which the eurozone is now shying away from. This is also a much larger decision than the eurozone is currently making out the banking union and single supervisor creation out to be. Ignorance should not be an excuse. It appears as though it is seen as OK to create complicated structures that the board and regulator can't understand. Ignorance is not an excuse in other areas of law, I do not see it as an acceptable excuse in banking. Make the board liable for losses in the bank they failed to control – a debt that is non-dischargable even through bankruptcy. That should incentivise the board to keep it simple and therefore also make it easier for the regulators to regulate. Money-market funds are (I believe but am unable to verify) mostly funded by large multinational companies. If they are, then it might be possible to starve the money-market funds of their funding. Large multinational companies usually have large piles of cash as they are able to demand long payment times to their suppliers. By placing the money they've kept on longer with money-market funds they can earn 'free' profits (This is why corporate treasurers can be very well paid). Legally limiting payment times to be 30 days (instead of what multinationals currently use 90-120 days or even longer) would significantly decrease the money large multinationals have to invest in money-market funds. May or may not reduce the influence the shadow banking sector has but it would definitely increase the velocity of money. 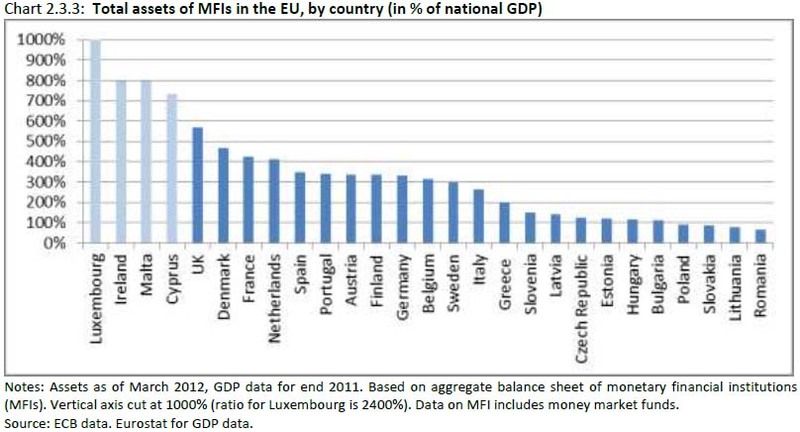 There will only be healthy banking in Europe when there are healthy economies in Europe. 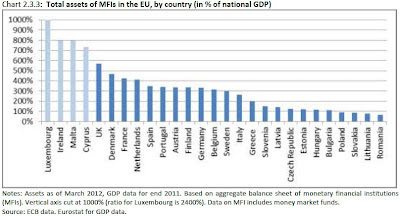 This will only be achieved when the nations get out of the Eurozone; and out of the EU. 20 years ago I bought an E type Jaguar, thinking that prices had fallen as far as they would, after the crazy late 1980's boom. They continued to fall, but the specialist Jaguar dealer refused to lower his prices to the now correct lower level - and went bust because he had no turnover. I pointed out to him that he should grit his teeth, sell his stock for whatever he could get, and buy more stock at the new lower price, to get things moving, but he would not. The relevance of this is that what he was doing was refusing to crystalise the loss by selling, even though the loss had already taken place. That is exactly what many if not most banks across Europe - and indeed here - are still doing, 4 years or more after the crash, still showing in their accounts at face value loans that they know perfectly well will never be repaid at face value, if at all. It is the uncertainty about these banks' real position that makes others too scared to lend, so the whole system has seized up. As with that car dealer, it cannot be fixed until honest and trasparent valuations are applied, and many of those banks go bust.